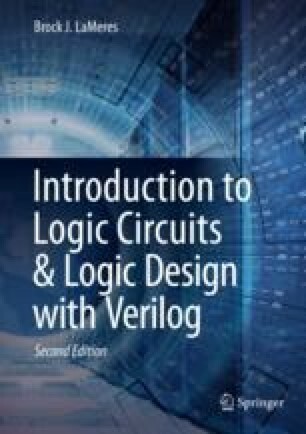 In this chapter we cover the techniques to synthesize, analyze, and manipulate logic functions. The purpose of these techniques is to ultimately create a logic circuit using the basic gates described in Chap. 3 from a truth table or word description. This process is called combinational logic design. Combinational logic refers to circuits where the output depends on the present value of the inputs. This simple definition implies that there is no storage capability in the circuitry and a change on the input immediately impacts the output. To begin, we first define the rules of Boolean algebra, which provide the framework for the legal operations and manipulations that can be taken on a two-valued number system (i.e., a binary system). We then explore a variety of logic design and manipulation techniques. These techniques allow us to directly create a logic circuit from a truth table and then to manipulate it to either reduce the number of gates necessary in the circuit or to convert the logic circuit into equivalent forms using alternate gates. The goal of this chapter is to provide an understanding of the basic principles of combinational logic design.